The youth, often called digital nomads, seems to be comfortable with technological changes…however, how do they really feel towards their future of work? Are they scared, fearful and uncertain? Or maybe very confident to handle the future demands? Majority of the youth global population (approx. 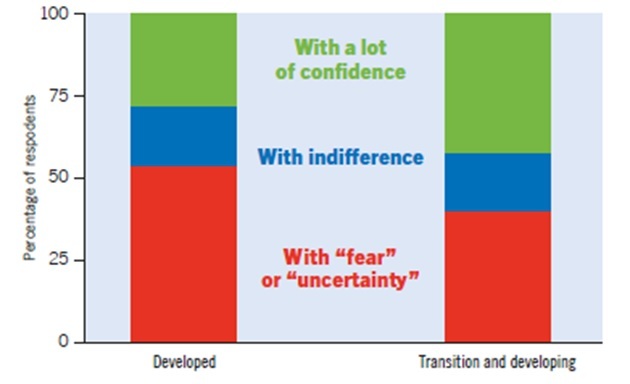 50 % from develop and 40% developing countries) perceive their future of work “with fear” or “with uncertainty”. Most of the worried respondents lived in Europe and Central Asia and in the Americas, where there has been the greatest technology diffusion. Robots and other automation technologies are still concentrated in developed countries, whereas developing and emerging economies continue to rely mostly on low-skilled and low-cost labour. Therefore, the findings also differ among the youth from developed and developing countries, however, it must be underlined that in both cases majority is fearful and uncertain towards their future work life, which affects national and global employment. Consequently, young people more than even before demand job security. On the basis of the ILO survey (2017), there is a significant increase in the demand of security among young male and female. Around 30% of overall respondents among the global youth population, has admitted that they expect to find secure job within 10 years’ time and that the level of job security is needed to be higher than the one they currently have in their work places. On the other hand, the perception of the youth on the effects of the technological changes on job is neither positive nor negative. The study across countries and continents have revealed that the majority of youth perceives technology as the main cause of destroying but also creating new work places equally. In general, youth share common opinion that technology will bring new places of work while deleting many of those that are currently known. However, more respondents (21%) have admitted that technology will destroy more workplace than create (only 9%). The expectations and perceptions of the youth towards their future of work, their feelings and insecurities are the key for the human resources management practices in the organizations. According to the Global Shapers survey (2017) concerning young people’s own experience, business can do three things to create more youth-friendly culture in the workplace in the future by providing “opportunities to contribute to vision and strategy” (41.4%), offering “mentoring and reverse mentoring” (34.3%) and ensuring there is a culture that “accepts failure as a learning experience” (33.9%). Furthermore, the current studies (ILO,2017) unveil interesting contrast where new generations highly digitalized and many times choosing new workplaces (such as online or platform based) are demanding very traditional working conditions with good wages, social protection, benefit and possibilities for career development with the highest importance for friendly environment at work. It seems that regardless the changes in the labour market the demands seems to be associated with the traditional forms of employment. It all allows us to conclude that yes, the young workers entering the market are scared and uncertain, however the role of future employers is to welcome young workers with youth-friendly organizational culture, protection, security, collaboration, acceptance of failure and ‘helping hand’ of reverse mentoring where the older employee provides a proverbial wing to shelter the new arrival and guide the individual through the organizational context toward success and in turn, the youth share their technological expertise with the older employees, who may be struggling to unlearn old habits and embrace new productivity tools. (Meister & Willyerd, 2010). ILO, 2017, Global Employment Trends for Youth, Paths to a better working Future. Global Shapers Survey, 2017, Annual Survey, pp. 31-35.